Remember how last week I was waxing poetic about the perfect weather? We've now reached the point in May in North Carolina where it's absurdly hot and you realize that you won't be actually cool again until October. Blergh. Nevertheless, it was a lovely week, filled with family time and friend time. One of the highlights was definitely going to vote with my mom in the primary election. All but one of the candidates I voted for won, and it has me very excited for the fight and change to come this fall. The best thing I've read in the past week is Ta-Nehisi Coates's piece in The Atlantic reflecting on the recent Kanye drama entitled "I'm Not Black; I'm Kanye." I am not a huge Kanye fan (I like some music, thank you for Chance the Rapper, but I can leave the rest of it), but I loved this essay. First of all, there is no better writer out there than Ta-Nehisi Coates. The essay is very personal, nuanced, and empathetic while providing an articulate critique of Kanye's bs. It's fantastic and well-worth reading (even more than once). I'm not even ashamed of how much I love Jeopardy. This week and next are the annual teacher's tournament, and I have been tuning in every evening to watch. Literally, my dream job is to be a member of the Jeopardy clue crew. I went to see the North Carolina Master Chorale perform Hector Berlioz's Grande Messe des morts (more commonly known as his Requiem) on Tuesday night. During my senior year of high school, my choir was invited to be a part of a choral festival that culminated with a performance of the Berlioz Requiem in Carnegie Hall (here is a little more background about that performance/the piece, and peep our review in the New York Times here). This is a very special piece of music for me, and it was incredible to hear it performed again. It was beautifully done and just as affecting as it was seven years ago. There are about a million restaurants that have recently opened/are opening soon close to my office (granted, it feels like 75% of them are the same iteration of pizzeria). 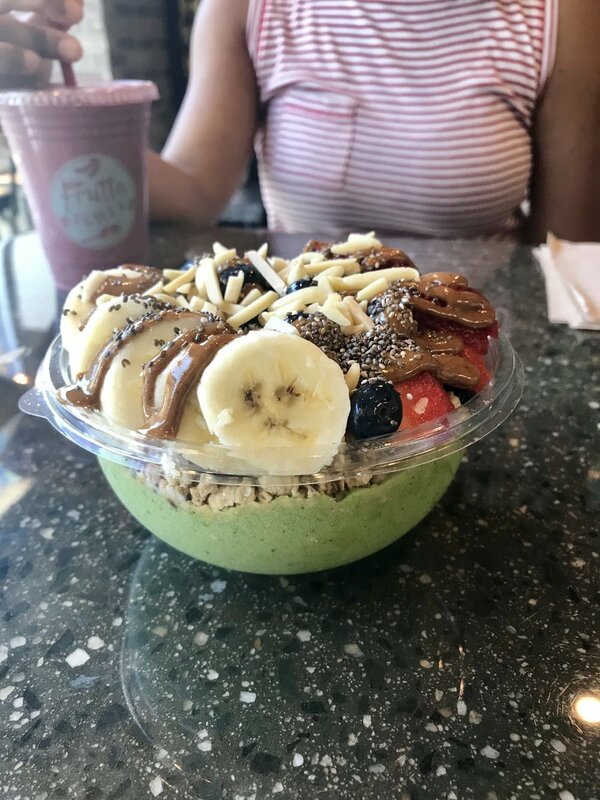 I tried one of them, Frutta Bowls, this week, which is a smoothie and smoothie bowl restaurant. I had a kale smoothie bowl for lunch (with banana, strawberries, blueberries, almond butter, chia seeds, protein powder,...and maybe something else on it). It was delicious and surprisingly filling. Can't wait to spend way too much money there! Voting, fresh flowers, jumbo slices of pizza, face masks, margarita nights with friends, Janelle Monae music videos, and early bed times.